Provence is noted for its melons, especially the famed Cavaillon melons. Street stands laden with succulent fruit are ubiquitous here at this time of year. Melons linked with the name Cavaillon are charentais melons, a European cantaloupe. 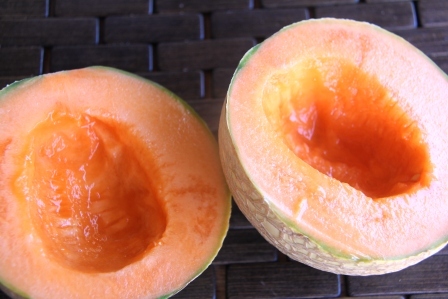 What Americans call cantaloupes are muskmelons and not as sweet as the prized charentais. The Popes, who lived in Avignon during the 14th century, introduced the fruit to the area. 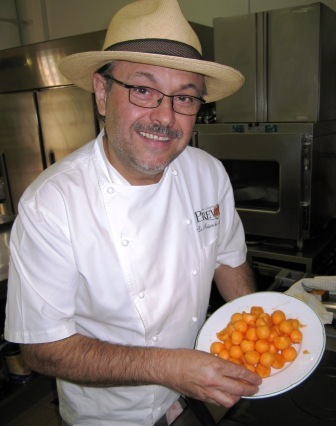 Back in Italy they enjoyed melons from Cantalupo, a small town where they had a summer residence and from whence the name cantaloupe originated. The Popes had the precious melon seeds planted in Provence where they grew and flourished in the strong summer sunshine. Today the town named Cavaillon basks in the glory of its elegant fruit which is honored during a three-day melon festival every July. (July 6 – 8 2012). However, Cavaillon melons are not necessarily gown around the town, but can come from a vast area of Provence. 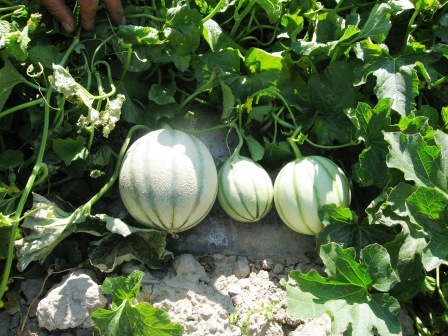 Cavaillon melons are at their best in July and August. Melons have a high water content which makes them low in calories. The deeper the orange of the flesh, the more carotenes the melon will contain. Trust your nose when selecting a melon – this applies to all melons, not just those called Cavaillon. A ripe melon should be fragrant. It should also be heavy. A slight crack at the stem end indicates ripeness. If part of the stem remains and is ready to break off easily, this also means the melon is ripe. I clipped this melon recipe from a French magazine. I love the combination of cheese, melon and pine nuts. If you try it, let me know what you think. Maybe you have suggestions to improve it. “Leave a Reply” below. Toast the pine nuts in a dry frying pan over high heat until golden. Scoop out melon seeds, then scoop out flesh with a melon baller. 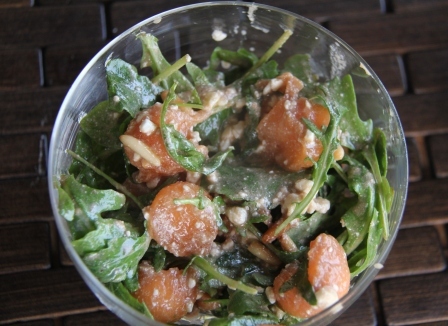 Put nuts, Feta, melon balls and arugula in a salad bowl. Mix oil and vinegar to make a vinagrete, then pour on salad. (You may not need all of the vinagrete. ) Salt and pepper to taste. Serves four. I have time I will be back to read a lot more, Please do keep up the great b.